A rich and hearty chili that has been slowly braised with red wine, dried peppers, garlic, and tangy mustard. It may sound like an odd combination, but this Braised Chili with Red Wine is spectacular! A few years ago, we were hanging out with some of our dear friends watching football and eating food. Our friend had been bragging about his chili for quite some time, and he was anxious for us to impress us with his signature recipe. Now I love chili, but doubted that his chili was going to wow me. His secret was red wine and mustard!! I had never heard of such a combination, but it is delicious! 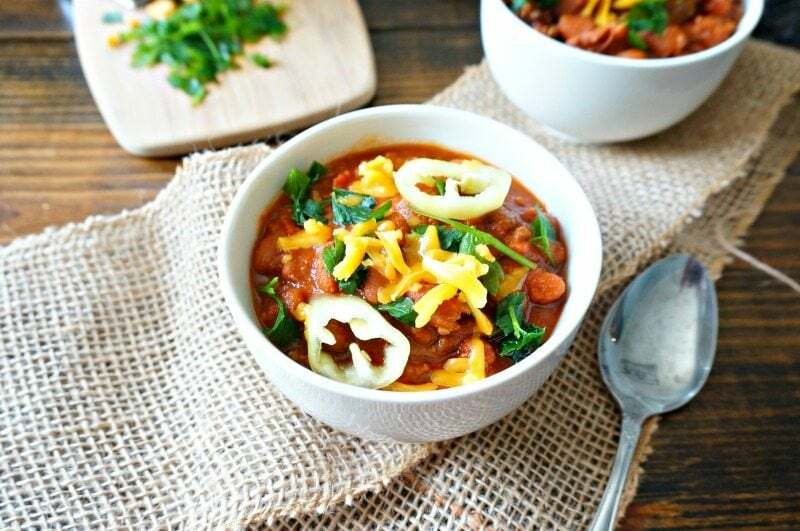 This chili is rich and hearty and full of unique flavors. The red wine adds depth and the garlic adds sweet undertones. Through in the dried chilis and mustard for tang and heat and this chili has it all. In a large heavy bottomed stock-pan, brown beef with onions. Drain off fat, and return beef to pan. Add in red wine and bring a boil, scraping off any browned bits on bottom of pan. Let simmer for 5 minutes for alcohol to evaporate. Add in tomatoes, mustard, garlic cloves, dried chili, water, seasonings, and beans and bring to a boil. Reduce heat and simmer for 3-4 hours, until garlic cloves are sweet and tender. A hearty chili made with beef, beans, red wine and mustard. Over medium heat, brown meat with onion. Once meat is browned, drain fat. Add in red wine and deglaze pan. Let simmer for 5 minutes, for alcohol to evaporate. Add remaining ingredients to the pan and bring to a boil. Reduce to a low and simmer for 3-4 hours, stirring occasionally. Before serving, fish out the dried pepper and discard. I leave the garlic cloves in the chili because at this point they are tender and sweet. Any chili that simmers in 2 cups of red wine has to be good 🙂 This is a really unique combination. I’m definitely going to try it! Girl, you will LOVE it!! What a beautiful chili Kristen. I would have never thought of mustard and red wine. Wow. I’ve got to try this. Such a pretty bowlful! I am so intrigued by the red wine and mustard and seeing you had 4 bowls – I clearly NEED to try this version out! Thanks so much for the inspiration Kristen! I’ve had chocolate and bear in my chili but wow! Mind blown by this! Girl, your mind will be blown by this!! I’ve never heard of red wind and mustard in chili either! But I bet it’s great!! Looks wonderful! Melissa–you have to try it! 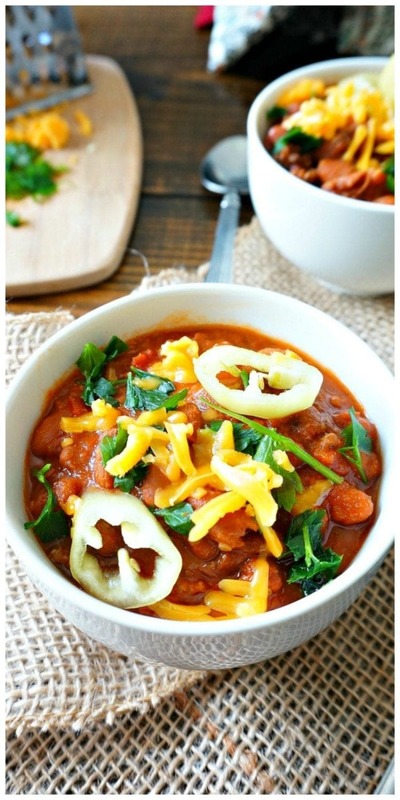 What a delicious take on chili such great flavors!